Preparing for a secure financial life requires a disciplined plan. Like a flight plan to a pilot, a compass to a hiker, we work together with you to chart a course for your financial success. We help you clarify your vision for a comfortable retirement, prepare for unexpected expenses in life and guide you through major life events that could otherwise set you down the wrong path. Every client is unique and our job is to work together to create a strategy that is right for you. Life is uncertain. We work with you to help reduce the risk involved with those uncertainties. With the growing cost of college education, caring for an aging parent, and rising cost of living, we help our clients map out a plan designed to help protect them in the event of the unexpected. This helps to protect our clients due to a job loss, disability or medical need. If you are a business owner, we work with you to help you protect that important asset and ensure appropriate succession planning. Protecting one’s standard of living is something many people take for granted. Whether you have accumulated wealth already or are in the process of doing so, we work closely with our clients to help them retire with dignity and enjoy the life they have worked so hard for. 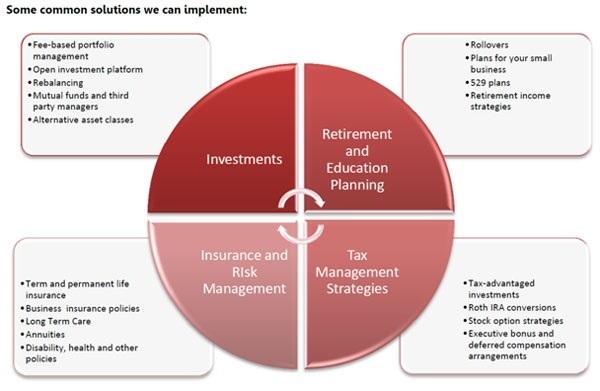 We assist them with understanding their income needs in retirement and how best to distribute that income over time. We help clients understand their cash flow and budget needs and how to allocate their wealth to help it grow in a manner that may provide them the comfortable life they always dreamed of. We take the role of our clients’ financial advisor very seriously. At the heart of our work is helping our clients maintain a sense of control around their financial affairs. From the first moment we work to understand what portfolio bests suits our client, we help them revise this strategy through life’s challenges and tribulations. We help them understand that investing is a marathon, not a sprint. Through this process, we help formulate what level of risk is appropriate in our clients’ portfolio in consideration of their financial plan and goals in life. Along the way, we’ll adjust for tax circumstances, income needs, and major expenses and provide our clients with a trusted advisor that is available to help address their concerns. 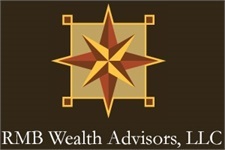 Accumulating wealth and preserving it for generations is a key variable in our relationship with our clients. In addition, effective estate planning is also about communicating shared values with children, grandchildren and other family members. We are ever vigilant of the changing estate laws and how they affect our clients. As such, we help our clients structure a strategy around wealth that is meant to stand the test of time and provide security for their family for many years to come. loss of principal. Investments will fluctuate and may be worth more or less than when originally purchased.